The multi-platinum New York trio announce a headline UK and European tour to celebrate the release of their new album ‘Another Mimosa’. Fun Lovin’ Criminals burst onto the music scene in 1996, gate crashing the euphoric Brit-pop party with unforgettable finesse. Heralded for their generation defining blend of styles and effortless Lower East Side charm, FLC’s refreshing cocktail of rock n’ roll, funk, blues, soul, hip hop, jazz and latin, gave the Crims a unique timelessness that is still apparent three decades on. FLC’s debut single ‘Scooby Snacks’, famed for sampling Tarantino movies such as Reservoir Dogs and Pulp Fiction launched a career that saw the debut EMI album Come Find Yourself remain in the UK album chart for over two years. FLC performed an infamously raucous set on the legendary Pyramid main stage at Glastonbury ’99 and the rest - as they say - is history. Still a mainstay on the festival circuit in UK and Europe, FLC are Europe’s best-loved “cousins from New York”, whip-smart story-tellers in smarter Saville Row suits who, through comically tall tales of living large in the neon metropolis, launched a career in music that saw three ordinarily New Yorkers who met working at the legendary Limelight on W 20th St, swap glass collection for world tours with their pals U2 and studio collaborations with the late-great BB King. The Lower East side trio consists of frontman turned Sony Award winning BBC broadcaster Huey Morgan, his founding partner Brian ‘Fast’ Leiser on bass, trumpet and samples and the groups longest-standing drummer Frank ‘The Rhythm Master’ Benbini. FLC returned to the studio this year with Grammy award winning engineer Tim Latham to make forthcoming new album ‘Another Mimosa’, their first studio abum since 2010. More details will be revealed on the album’s release shortly, but fans can well imagine a variation on the theme of the 1999 album ‘Mimosa’, which became a cult classic with Crims fans for featuring clever re-imaginings of classic covers and an impromptu guest appearance from Ian McCulloch of Echo & the Bunnymen fame! 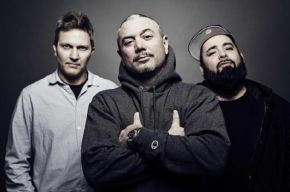 Visit funlovincriminals.co for more information and ticket sales.